It's been far too long since I've sat down to write for this blog. I have mixed feelings about it, but I've also been super busy. It takes a lot to run a small craft business. I don't think there is enough time in the day to do it all. There is no outside income from a spouse, trust funds, big grants, savings or business loans to help keep this thing going. It's all work and a lot of it. The business administration side of is quite complicated—scheduling sales and workshops, marketing them, finding materials, taking product photos, website stuff, bookkeeping, and the all important budget (there's a difference) the list goes on and on. Even with Jazmin taking on a good portion of the admin work, I spend almost equal time with admin as I do making. And what about my personal life, wait is there a difference? Sometimes it's hard to tell. Because my time is so limited I've had to pick and choose between spending time writing my newsletter or this blog. The newsletter wins out most of the time as it's more tied to engaging with more identifiable customers and patrons, as brutal as it sounds that is tied to sales and that is what keeps the margin in the black. Looking forward I am planning to write a few posts back to back over the next few weeks to bring you, dear readers, up to speed. I still really appreciate folks following along even though I haven't been that active here over the past few years. I'm getting into a nice rhythm these days, though, so there might be a little extra time to breathe some life into this blog. This rhythm is in part because I'm writing a book on pole lathe turning. I sit to write every day of the week and have done so for about a month. Things are flowing and I'm feeling more comfortable. I'll share more on the book in one of the aforementioned posts. The other reason for rhythm in the workflow at 'Woodspirit Handcraft' is that I have an apprentice helping me with production. Tom's been a great help and is learning a lot while he's here. Again I have a post started on that aspect of my business too. We left off 2 months ago with a post on my teaching tour last fall. For those who don't know, I taught 5 pole lathe turning workshops over about a month's time. I last wrote about the England part of the trip. 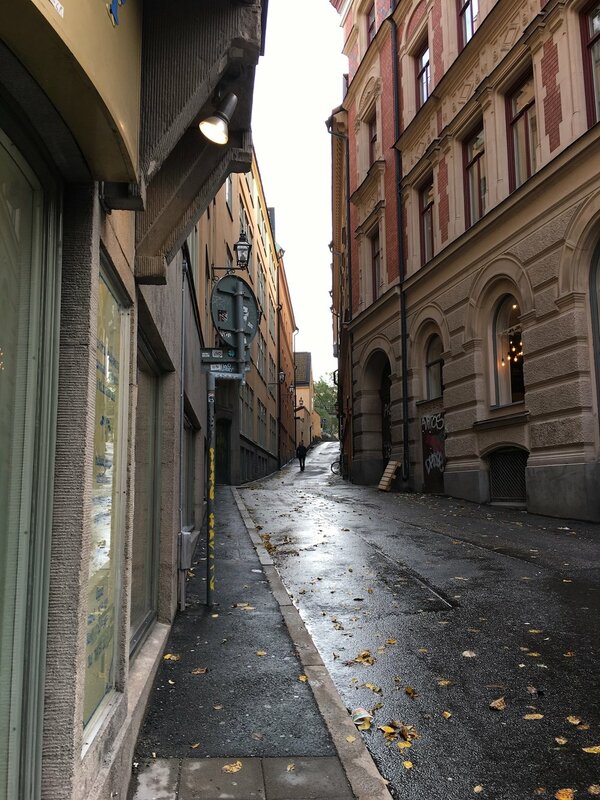 This post is about the Sweden leg of the trip. It's hard to pick a favorite because the whole European trip was a blast and each leg had it's own highlights. They all contributed to the whole. But having said that, my trip to Sweden was pretty special because it tied some of my past research and views on production work together. 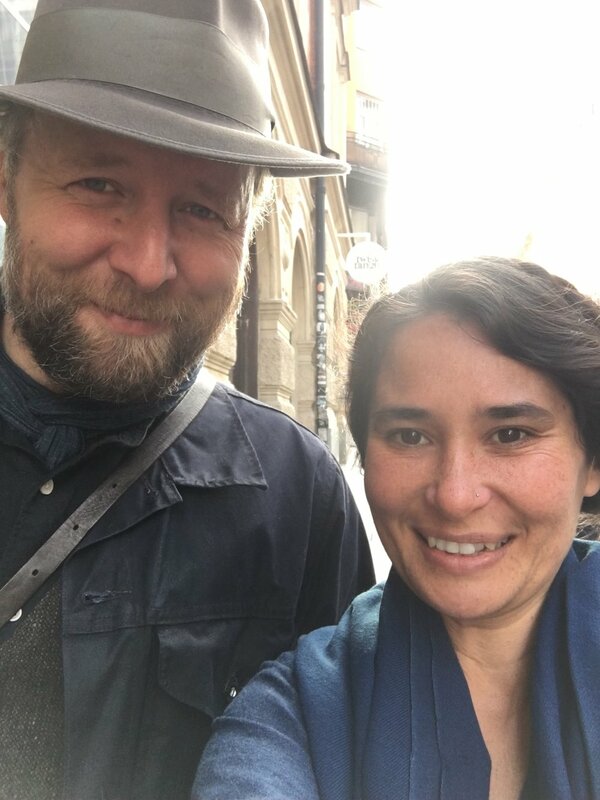 Anders and I in Kviberg. 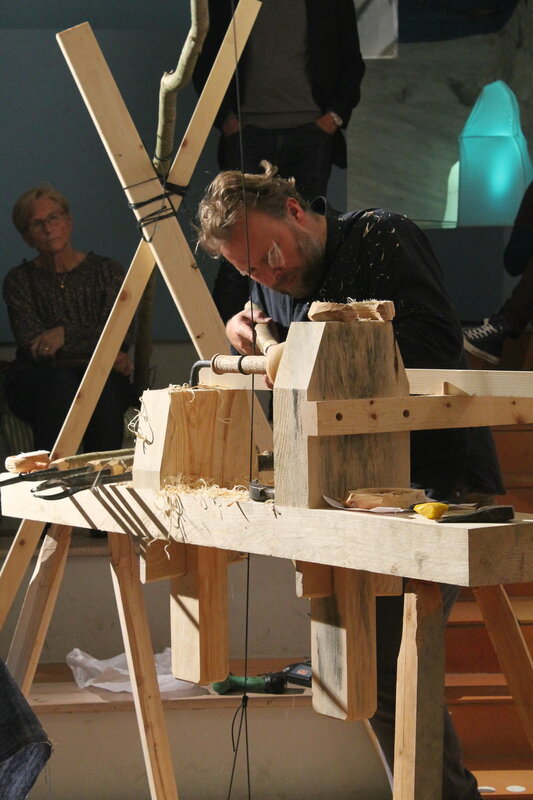 Last year sometime Anders Lindberg, a well known Swedish craftsperson and author, emailed me to ask about attending a pole lathe class I had scheduled in New York. It ended up he couldn't make it, which was ok as I had to cancel the workshop anyway. It was full, but the spoon carving class that was in tandem didn't fill so the trip wouldn't have been worth it. Anyway... Anders thought that maybe he could talk to our mutual friend who worked for Västarvets as a Hemslöjdskonsulenter. This is a government organization who's job it is to promote handicrafts in the country. Anders wanted to see if they could help bring me over to teach. In 2014 when I went over to Skedfest I also visited the same region Anders lives in. It has a very rich turning history. I wrote about it here and here. For over 300 years it was Sweden's turning center. Records show that something like 30,000 turned boxes and as well as other impressive quantities of different craft goods left the region to be traded all over Sweden every year. Learning about the craft industry of that area helped to inspire my ideas about production work and also set the tone for my business today. So the trip that Anders was hoping for was really exciting to me. If I could help inspire folks to turn using the same techniques of the past and breathe a little life into the old and lost traditions of that area, my work would come full circle. Sharing what I'm learning is a key part of my ethos as a professional woodworker/traditional craftsperson. The hard part of teaching pole lathe turning is that the lathes are big and heavy and the tools needed to turn aren't something you can buy from a tool supplier. So part of the plan was that Anders needed to build the lathes before I arrived. He and I emailed back and forth for a few months sorting out construction details before he began to build them. Center: Sara Degerfalt, Craft Consultant, during a radio interview in Boras. I'll leave out a lot of the little details and just say that it was a busy week. The whole trip was organized by Sara Degerfält, a craft consultant, who took us around and made sure everything was in order. Thank you Sara! I gave two talks with a photo slide presentation about my current work which is very much inspired by my research in Sweden back in 2014. I also gave 2 turning demos at 2 different museums in the area. Both were very well attended. It was exciting to see the interest. In one demo there were 4 different generations in attendance. This was powerful to see. I also had a chance to visit a museum archive where I looked at more turned goods. Then there was the course I taught on pole lathe turning. As far as I know there hasn't been a pole lathe turning workshop in Sweden since my friend Robin Wood taught one at Saterglantan over 15 years ago. 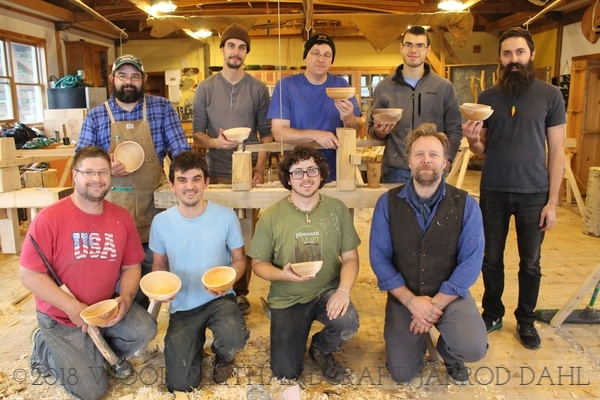 There are also just a few folks that I know of turning bowls on pole lathes in Sweden. I find it a little surprising since the craft scene in that country seems to be very well supported and holding strong. The workshop was filled with young people! This is not always the case with hand tool related events so it gives me a lot of confidence to say that the trip was a great success. 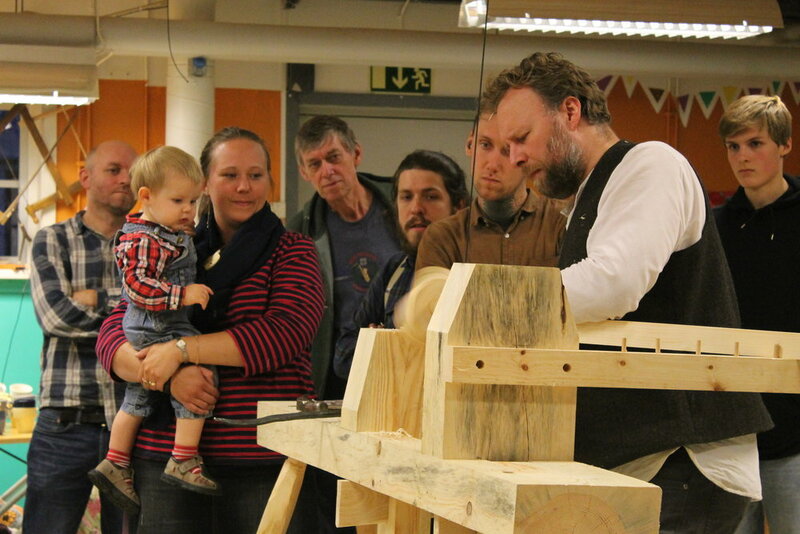 I know these folks will keep at it and hopefully the use of the pole lathe in Sweden will grow. Someone who has been turning on a pole lathe is Daniel Lunberg. I'd been following him on Instagram (@storslojd) for some time and has a few years of experience turning on the pole lathe. He began turning during his time at Saterglantan, and learned on one of the pole lathes left behind from Robin's course all those years ago! That's just insane. I mentioned to Daniel that I was working with Anders and that we were going to have a class in Goteborg. Daniel came down from the north, helped with set-up, was my assistant in class, traveled to help with the lathe demos, and visited the museum archives with us. He is not only a great guy but is also a very talented woodworker, an attentive teacher and was a great help in the class. We had some good laughs too. All in all I met some really kind and generous people. Folks that choose to steep their lives in craft and the handmade-this could be anything from shoes and clothes, houses and furniture, to the love of wooden spoons that we all seem to have in common. I can't help but think that people, at least in this scene, desire to know where things come from and how they are made. They will search for quality (and that comes in many forms) in those things and add what they can to their everyday lives. They understand that those things give us a certain quality of life. We had 2 extra days at the end of our trip and because Jazmin has never been to Sweden before, we spent those days wandering around Stockholm. It's such a cool town. To top it all off we got to see the new Blade Runner on the big screen there too. Ha. Once home we turned around and headed up to North House for one last turning workshop. It was nice to be in my home turf. Ironically there was a visiting instructor from Sweden teaching that week too. Stefan Nordgard was the guest instructor for about a week. He is the turning instructor at Saterglantan and uses modern electric lathes. It's also wild that he was responsible for inspiring Daniel to pursue pole lathe turning when Daniel was a student. So this trip had a few paths that came full circle and intertwined together. These are the experiences and stories that make this world seem small at times. It's amazing. North House is an amazing place. It usually brings a few folks from all over the country to attend classes there. It's great meeting folks from all over. Sharing stories is what ties us all together. I always feel pretty inspired after teaching. Stefan and I traded bowls. North House class proudly showing off there hard work.